Parchment paper for wrapping or banana leaf to serve. Bake in the oven for 10-15 minutes over medium heat until ready to be pulverized. Once ready, purée in the blender until you get a powder like form. 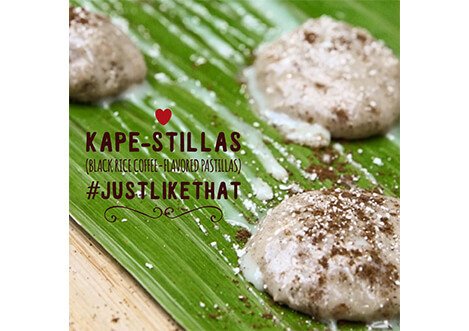 Start making the pastillas: In a mixing bowl, combine powdered milk, condensed milk and black rice coffee. Mix and mold into bite size pieces. Dust with pre-made egg shell calcium to finish.